At GRIT, our youngest riders hold a place close to our heart: There's nothing more incredible than seeing the joy of a young rider taking his or her first ride in a GRIT Freedom Chair. Today's Rider Spotlight features Ollie! Read on to learn more about his adventures. I love watching him speed off ahead of us on whatever path we’re on, enjoying his own independence and ability to fly. 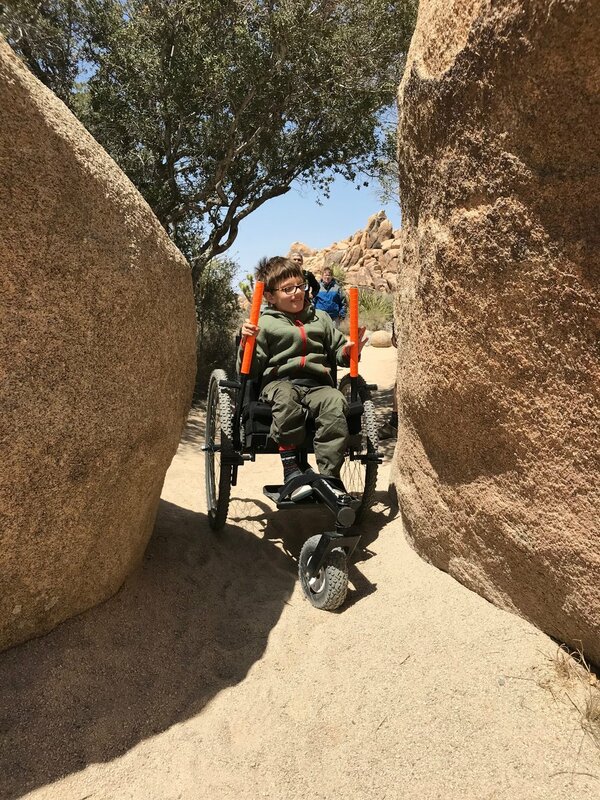 It was frustrating to Ollie that his legs got tired biking, limiting his independence, and while he loves his [ultralight] wheelchair, it can’t handle grass, so it’s fairly useless at the park or on anything other than floor or pavement. Even in our own backyard, he couldn’t chase his brother from concrete to grass to mulch . . . on his own. She explained how Ollie outgrew the equipment he used to stay active when he was younger. We got a [modified] tricycle when Ollie was three years old, which was great during activities like fun runs on the field at school and on walks and hikes with the family, but the trike is quite heavy, difficult to push up a mountain when Ollie’s legs get tired, and of course, bikes aren’t designed for long stretches of sand at the beach. As he got older, Ollie became a bit of a wild man, and tipped [it] a few times when he ran over a rock or curb or turned too fast, so we felt he couldn’t be truly independent in it and safe at the same time. Why did Ollie and his family decide on the Freedom Chair? We were also interested in the fact that the GRIT Freedom Chair offers good cardiovascular exercise. Aside from physical therapy, walking on the treadmill, and the occasional wheelchair racing event, a kid with CP typically doesn’t get enough opportunities to burn off as much energy as he needs to. Additionally, she felt good about the safety features of the GRIT Freedom Chair. Unlike adult riders, Ollie’s respect for his own safety just isn’t there yet, so we were relieved when GRIT released the adjustable anti-tip bars, and felt safe leaving Ollie to his own daredevil devices when tackling uneven terrain. What activities does Ollie enjoy doing in the Freedom Chair? Ollie now knows no limits! 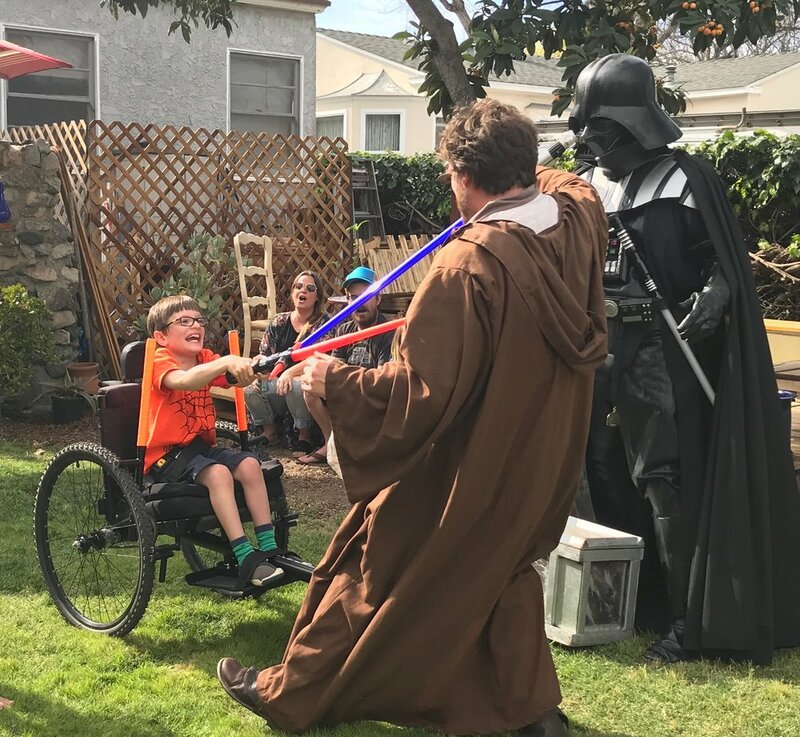 As you can see from the pictures, the chair goes everywhere with us: On hikes in Joshua Tree and Big Bear or into the nearby Verdugo Mountains with the Boy Scouts, on beaches everywhere, and in epic Jedi battles in our backyard. What is Ollie's favorite thing about the GRIT Freedom Chair? One of Ollie’s favorite things about the chair is that it can go in water, so when we go to the beach or another body of water, he always makes a beeline for the shore. Ollie’s family’s favorite thing about the Freedom Chair that it gives him the ability to be active under his own power. 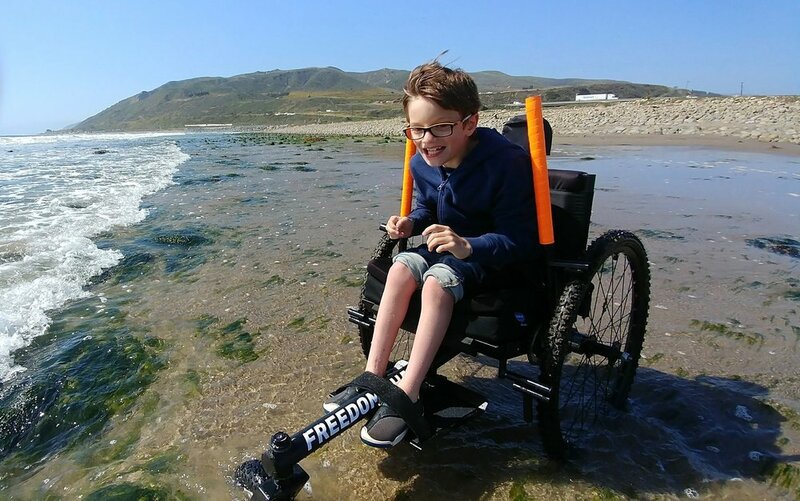 We also love that it’s so easy for him to power on his own; his upper body is very strong from years of crawling at home and using his wheelchair out and about, so the design of the Freedom Chair is perfect for him . . . the look of joy on his face was unmistakable. As parents of kids with disabilities, I think we tend in the early years to focus a lot on gaining strength and skills through therapy—particularly physical therapy—and can overlook the importance of independence and keeping up with peers. Wheels are a beautiful thing, and I can’t tell you how glad I am that the Freedom Chair exists to extend the range of Ollie’s roaming.